Groundteam offers a complete landscape garden design and build package covering all aspects of a beautiful, functional landscaped garden. 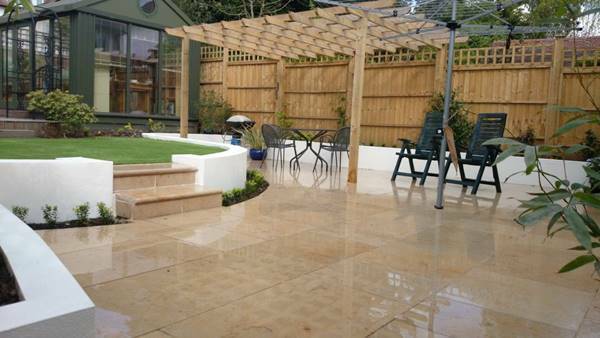 Our Landscape Gardening Services London provides everything you need for a outdoor life. Attractive, hard wearing and low maintenance surface achieved by bonding or fixing loose gravel. Learn More About Resin Bonded Surfacing? We work with a wide range of surfacing materials to create your ideal driveway. Our experienced team of landscape gardeners works confidently with all types of garden decking and fencing. Make the most of your outdoor space without bringing muddy footprints back indoors. Our experienced team of landscape gardeners works confidently with all types of artificial grass. Economy artificial grass Short pile is a good choice for high traffic areas, a cost–effective choice but looks less realistic. Midrange artificial grass Softer than economy artificial grass, a better choice for pets. Two-tone fibres look more realistic from a distance. Premium artificial grass Long pile and four colour fibre makes premium artificial grass hard to distinguish from the real thing. We can incorporate garden features such as lighting, steps and ponds ensuring they blend perfectly. Our experienced team of landscape gardeners works confidently with all types of garden features. Pond Ponds are a great way of attracting wildlife into your garden. We have experience building flexible and rigid ponds and can install water pumps and lighting. 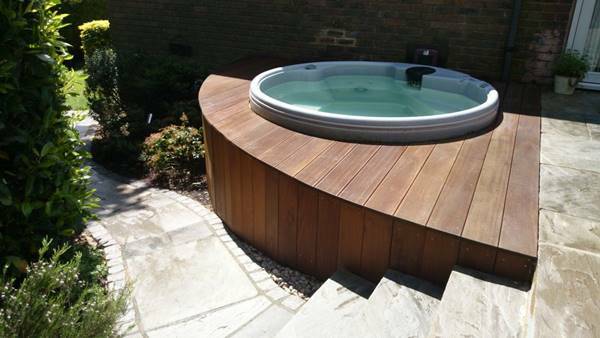 Hot Tub Complete hot tub installation from preparing the site by laying concrete foundations through to integrating with patio decking and outdoor electrical wiring. Lighting Outdoor electrical wiring installation for all types of outdoor lighting such as accent lighting for a patio or security lighting for driveways. Pergola Groundteam have experience adapting pergolas, arbours and arches to add interesting focal points which blend perfectly into any garden layout. All kinds of steps built using a wide range of materials including: brick, concrete, natural stone and timber or even railway sleepers. Walls Our team works with all types of hard landscaping, we can build freestanding and retaining garden walls in traditional brickwork bonds or rendered finish. Garden Buildings We have experience erecting all types of garden building including: sheds, log cabins, summerhouses and storage (for bikes, bins, tools etc). Garden design service from £275 including detailed scaled drawings covering all necessary elevations. Our garden design service includes fully detailed scaled drawings covering all necessary elevations detailing any groundworks or construction required. From complete garden designs starting with a blank sheet of paper to enhancing an existing scheme, we work closely with clients to get the best out of available space combining a selection of traditional and modern materials with professional landscaping techniques. Each design also includes basic planting designs and we can work closely with clients to produce more detailed planting designs if required. The cost of our garden design service is £275, which is fully refunded should clients wish to commission us to turn their design into reality. All types of groundwork from digging foundations, laying concrete bases to replacing drainage systems. Drainage repair or installation of domestic drainage systems (french drains, plastic drainage channels etc.) for driveways, gardens and patios. Preparation work for hard landscaping projects such as patios and driveways, trench digging for domestic drainage and general site clearance including hedge/tree stump removal. foundations Concrete footings laid for all types of hard landscaping projects including: driveways, garden buildings, retaining walls, patios etc. We take special care to prepare surfaces for new lawns using high quality topsoil and cultivated turf. Our experienced team of landscape gardeners works confidently with all types of garden lawn. We take special care to prepare surfaces for new lawns by eliminating weeds and rotovating and using the highest quality topsoil and cultivated turf.